← Did The Knicks Really Become Draft Lottery Winners? While it has been widely viewed that Gasol has always planned to return to Memphis, the truth is none of us really know. Sure, he’s basically grown up in Memphis. His family has been there since the franchise moved from Vancouver. They have a core of he, Zach Randolph, Tony Allen and Mike Conley that has won 50-plus games for three consecutive years. But what’s the one factor that could throw a huge monkey wrench into his entire plan? Mike Conley’s pending free agency. Although I admit that this whole scenario is largely based on the reports of Conley waiting until the 2016 off-season to sign a new deal, it certainly doesn’t necessarily mean he has an interest in leaving Memphis. But the most important factor of this report is the possibility remains in the back of the Grizzlies’ mind. Conley has refused to sign an extension, whether it’s just to get a bigger deal when the cap goes up or if he’s genuinely thinking of leaving for another team, it has to worry the organization. Even if the concern is minimal. Now, how is it possible for the Knicks to have a chance of getting both? Not as impossible as you may think. 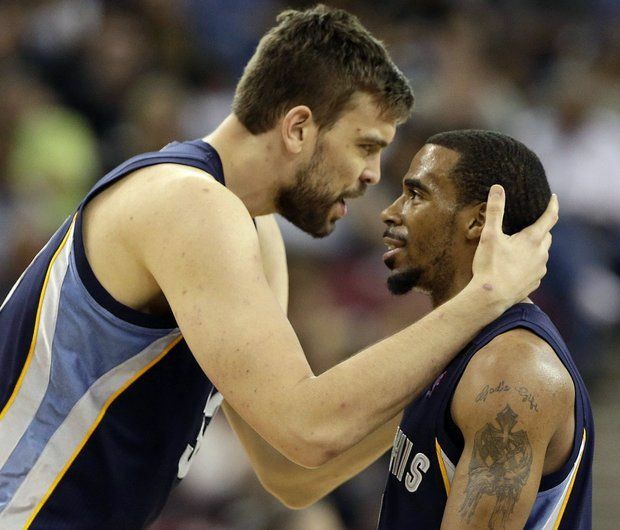 If Marc Gasol is worried for even a second about Conley not returning to Memphis, that could really open the door for him this off-season and explore what may look to be better options. Whether it’s San Antonio, Boston, etc. So if the Grizzlies actually starting feeling the pressure of Gasol possibly leaving and they’d automatically be in a rebuilding stage without the league’s best center, what do they do? That’s where the Knicks can come in. Give Marc a call and say “If we can trade for Conley, would you come to New York?” And if Gasol is intrigued by the trio of he, Carmelo Anthony and his longtime running mate Mike Conley then you jump on that phone and call Memphis immediately. With a sudden rebuilding stage now in sight and the possibility of losing their talented point guard the following season to free agency, the Grizzlies would be crazy not to listen to an offer. What can the Knicks offer, you ask? The fourth overall pick. Chances are the Knicks will be looking at D’Angelo Russell or Emmanuel Mudiay at fourth overall, but whoever of the top-four remains when they pick they will likely take. So in this case the would ultimately do what Cleveland did last season with Andrew Wiggins. Don’t sign him right away. By doing that it would allow the Knicks to move him by the end of August. So whoever it is they end up with at fourth overall, sending that player to Memphis in exchange for Conley is something they’d have to take into serious consideration simply by selling them on an immediate piece to begin their rebuild. Not a crazy idea if you could be staring at a team of Zach Randolph, Tony Allen, Vince Carter and Jordan Adams after next season if they lose Gasol and Conley for basically nothing. How can the Knicks afford Gasol, Anthony and Conley you ask? Not including their draft pick, the Knicks are expected to have roughly $33 million in salary cap space if the number does jump up to $67 million. If they were to sign Gasol to a max contract his salary would begin at $20.1 million, leaving about $13 million available. There’s no doubt that when Conley gets a new deal he will command more than $13 million, but the caveat here is the final year of his contract number for the 2015-16 season is just $9.3 million. Even giving the Knicks a few million to spare on the cap. And if the number does jump up another $22 million the following season, they’d have plenty left to retain Conley’s rights to his satisfaction. None of this will have any chance of happening of course if Gasol has every intention of returning to Memphis, and especially if Conley confirms to his longtime teammate that he plans on re-signing if he stays. BUT, if there’s even a little bit of doubt that Gasol is on his way out and has even remote interest in joining the Knicks, the Knicks should absolutely call about adding the services of Conley and form the best “Big 3” Carmelo will ever have in his career. If the Knicks can make this pipe dream come true then they’d be legitimate contenders, especially in the Eastern Conference. It may be a pipe dream, but sometimes dreams to come true.